This Lady and the Unicorn tapestry "Hearing (L'Ouie) I" shows the scene of the lady playing the organ, part of the series of tapestries “La Dame a la Licorne”. Her maid by her side listening and the meaning of these tapestries have been debated throughout history. They were though to represent the 5 senses as well as the final sense of intuition or desire. Here we see the lady on the pipe organ, surrounded by the ever present lion guarding here on the left and the mysterious unicorn on the right. We also see the blue, red and white royal crests of Jean Le Viste surrounded by the mille-fleur or thousand flower background with forest animals. This millefleur background was used to create a fantasy like backdrop to outdoor or even indoor scenes in 16th and 17th century tapestries in France. 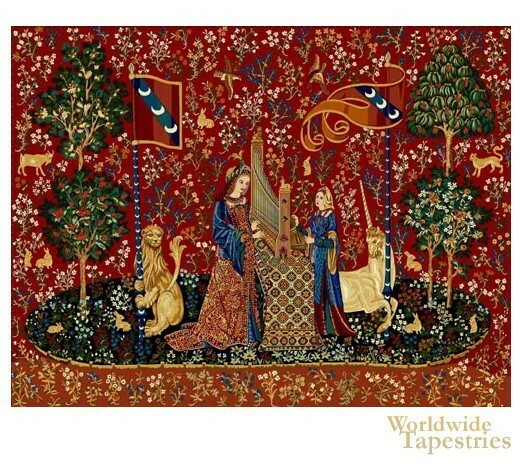 The original tapestries were thought to be commissioned for Jean Le Viste’s appointment to King Louis XI’s court. After Jean's death the tapestries were scattered throughout his relatives and today have been reunited in the Musee National du Moyen Age in Paris. This "Hearing (L'Ouie) I" Lady and the Unicorn tapestry is lined on the back and has a tunnel for easy hanging.